In 2007, leaders from 54 African countries and 27 European states established the Africa-EU Strategic Partnership as the formal platform for cooperation between the two continents. Under the partnership, heads of state and government meet alternatively in Africa and Europe every three years to take stock of and establish priorities for the regions’ evolving relationship. The fifth EU-Africa Summit is scheduled to take place in November 2017 in Abidjan, Côte d’Ivoire on the theme of “youth” and young people’s unique economic and security challenges. In advance of the summit, EUROSTAT recently released The European Union and the African Union: A statistical portrait (2016 edition), which provides an overview of key demographic, social, and economic indicators across African and European countries—the latter now also including Croatia, which joined the European Union in 2013. 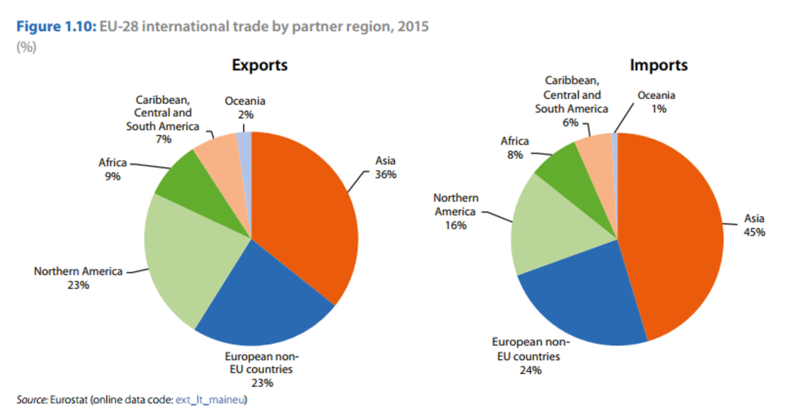 The figures below highlight some key EU-Africa trade statistics, including information on Africa’s share of EU trade, as well as the trade balance and the breakdown of goods traded between the two regions. 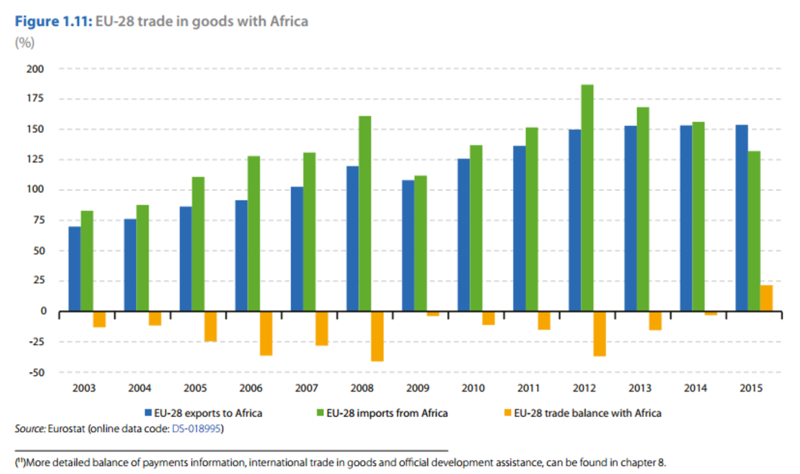 Figure 1.10 indicates that Africa’s share of EU trade was relatively low in 2015, representing 9 percent of exports from the EU and 8 percent of imports to the EU. By contrast, Asia was Europe’s largest trading partner, accounting for 36 percent of exports from the EU and 45 percent of imports to the EU. The EU maintained a negative trade balance with Africa from 2003 to 2014, but in 2015 the balance turned positive, as seen in Figure 1.11, as the value of crude oil and natural gas imports from Africa dropped due to significant declines in the prices of these commodities. 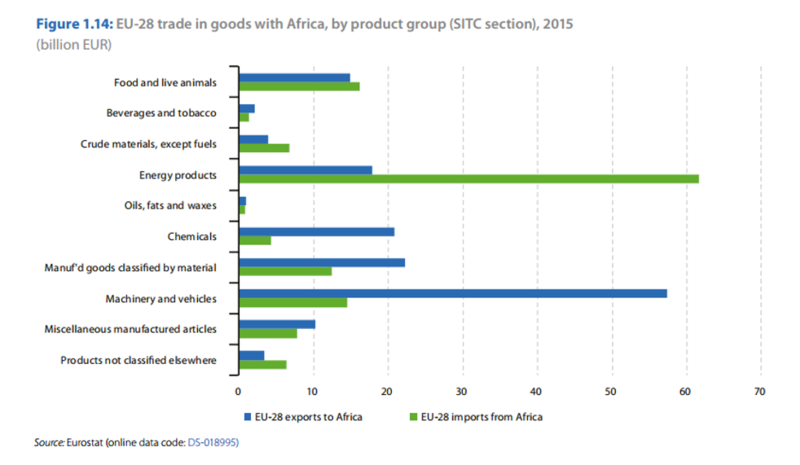 Still, Figure 1.14 shows that African energy products were, by value, the most important imports to the EU in 2015. On the other hand, the EU mostly exported higher value-added products to Africa in 2015, including machinery and vehicles, manufactured products, chemicals, and refined oil products. Source: EUROSTAT, The European Union and the African Union: A statistical portrait (2016 edition).